I put the flag out on my way to work this morning and left it up for Donald to take down. 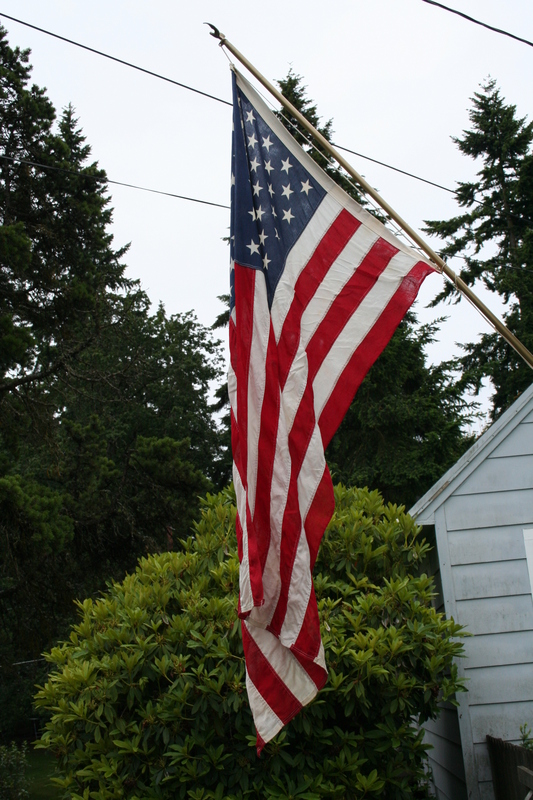 That’s all I did for Flag Day (I think it is all you are supposed to do). The other things I did today included working, playing a part in a miracle, worrying about dog names and purchasing things for said dog. It was not as busy a day as it might sound, but it was kind of spendy. I suppose I should tell you about the part in a miracle, but it really wasn’t anything. I just made a decision based on someone else’s demeanor and I asked my superiors for permission to make that decision. And the affected person said (through tears), “It’s a miracle!” And I was left to contemplate my own role in helping a fellow human out who so obviously needed a hand up. I just listened to my heart. We should all listen to our hearts. Mentally, I spent most of the day ruminating over names. Before I go any further, I want to say that while I appreciate and “get” the reference to George, I have already eliminated it as a name. Sorry, Terry: the CFO of our company named a kitten George from the same cartoon. So George has been taken. I ran through place names, but there aren’t any good place names that represent places I like to be (or places I have been) that are also good dog names: Alvord? Ely? Reno? Boise? Baker? Hokkaido? No, no, no. How about other animal names, like “Bear”? Well, I knew a Bear, but he was a scaredy-cat Chow-chow. And I don’t want a name that gives the dog permission to be ferocious. Elk? Coyote? Moose? A color is out and so is a candy bar. Hersheys, Blue, Snickers, Uno, Red… Did you know that all of the Irish Setters in Jim Kjelgaard’s Big Red youth series were named Red something? How original. (I read every one of those books at least three times. Along with “White Fang” and “Call of the Wild” (Buck) and all the Black Stallion, Golden Stallion and Flicka stories.) “Mutt” was the name of Farley Mowat’s “The Dog Who Wouldn’t Be” and that doesn’t fit, either. Scratch story book dog names (and horse names). I think I have exhausted my favorite novels, actors, car models, animals, colors, shapes (Stripe is high on my list after the cartoon dog in the comic strip Tiger). In other news, finding the dog was just a step. It is forcing Don’s hand to build the dog kennel we purchased over a year ago and still have not put up. We do have a fenced yard, but it is not secure (a dog could crawl under or possible jump over one section). I need a temporary dog run for the dog, so I purchased one tonight. That was fun. I found one that I likes at one site for $64. Same one at another site for $62. The first one offered a wire mesh top (very wise idea) for $49. The other site offered the same top for $24. Hmmmm. I work in a mathematical field… So I went through the steps to order the cheaper one and all was good until I got to S&H page. EEEP: cheap site wanted $65 S&H for STANDARD shipping. I ordered through the pricier site & got 3-day shipping for $10 more than the cheap site & standard shipping. Does that make your head hurt? Actually, I think you are trying too hard. Wait till you get him home and the name will come to you…or him, whichever he chooses. How about Rowdy (from Wagon Train I think?). I’m terrible at picking animal names. I always seem to pick flower names. You might just have to live with him for a bit and see if that helps find a name! Opie comes to mind, too. My three favorite dogs have been Bo, Pirate and Zeke. Bo and Zeke have passed on but Pirate is still with us. All three are (were) awesome dogs! Pirate is one of the names I’ve been tossing around! Maybe I’ll set that aside since you have a Pirate. All of those are great dog names. You can use Pirate because we don’t really know each other at all! Although I feel like we do!